Your wedding day is the most important day of your life. 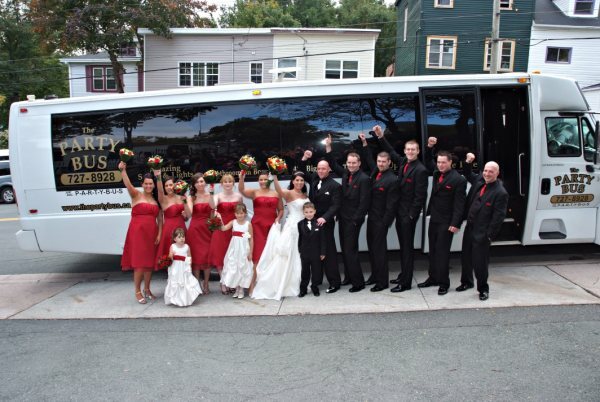 Why spend it cramped in a small limousine when you can enjoy the spaciousness and luxury that only a wedding PARTY BUS can offer? 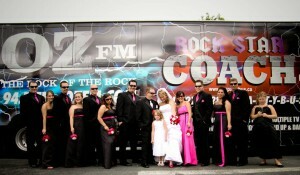 2007 Introduced Brides and Grooms to The PARTYBUS and there is no turning back. We have the great prices (our smallest is about the same as a Limo! ), for the best machines for your Wedding. Everyone (and we mean everyone!) 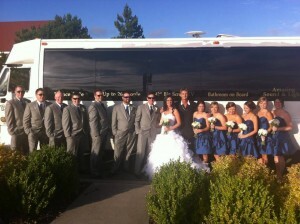 that has booked The PARTY BUS for their Special Day has said it was the TALK of their Wedding. Give the Gift that your Bridal Party REALLY Wants…The PARTY BUS! Consider the convenience of having all of your wedding party together. 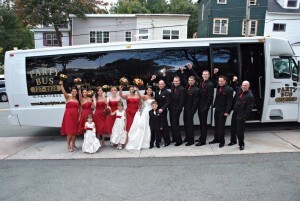 Six buses, with a capacity of 20, 26, 30, 40, 45 or even 60 people, you can have parents, the groomsmen, bridesmaids and more! No worrying about everyone showing up on time for pictures or someone from out of town getting lost. Everyone can relax on the couch like leather seats, have a drink, dance and party to and from the church because you are all in one vehicle! Think about the UNBELIEVABLE Convenience of have a private bathroom for your group wherever you go! No Limo can compare to that! With ample leg room and high ceilings, all the ladies can feel relieved that their dresses stay wrinkle free. Air conditioning for those hot summer days insure everyone stays comfortable. And in case you feel like getting the party started a little early, you can always crank up the tunes and enjoy the amazing sound system. Any way you look at it, the PARTY BUS will make your special day even better. Contact us and we’ll e-mail you a copy of our most recent wedding pamphlet! Several dates in summer of 2019 close to be sold out so DON’T DELAY! and 2020 dates are starting to fill in as well!